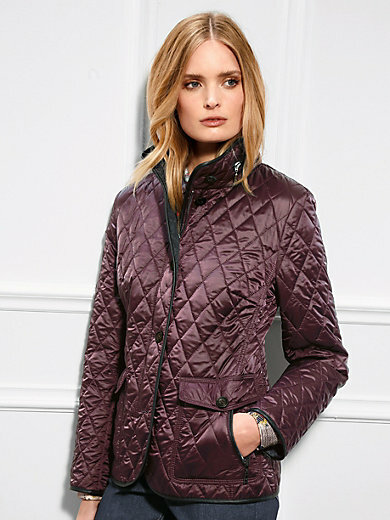 Quilted jacket by Basler. A stylish yet casual mid-season jacket made of shimmering microfibre. The stand-up collar features an incorporated hood, the edges are trimmed with elegant leather piping. The elaborate cut with stitched lengthwise seams ensures a perfect fit. With button facing, concealed zip fastener and 2 buttoned flap pockets with additional zipped pocket. Outer and filling made of 100% polyester. Lining in 100% nylon. Length approx. 25ins. The jacket is machine washable.